It's a good thing I don't have any Italian ancestors, because if I did, they'd be rolling over in their graves at the sight of my homemade pasta! Given that I'm focused on chronicling my experimentation in the kitchen these days, I'm not afraid of posting about my failures here - for both your horror and amusement - and not just about my successes. Thus, I present to you, my Homemade Spaghetti Carbonara. Just over a year ago, when I was living in Seoul, I attended a cooking class hosted by the O'ngo Culinary School, which was then in Gangnam but has since relocated to the Jongno-gu area. I had received accolades from friends and family who thought I was going there to learn how to make Korean food, but in actual fact, I was attending a pasta-making class under Chef Shawn Park. I believed, and still maintain, that I would experiment with Korean food once outside Korea, when I was really craving it and when it wasn't readily available from any street corner, spectacularly and expertly made by any number of fabulous old ladies in the city. Amazing food at ridiculously cheap prices (tips were always refused!) was always available, 24 hours a day: far better than I could ever make and far cheaper. I did buy a Korean cookbook two days before leaving the country, and it's going to get cracked open very soon, now that I've discovered a certain, key ingredient at my local Asian grocer: kimchi! Now, back to my pasta. This cooking class I attended really took the mystery out of making pasta for me, in the best way possible. I had no idea how simple it was, at least for noodles. I have yet to try making other pasta shapes - ravioli, cannelloni, etc. - which I imagine to be more difficult and requiring more skill. I tracked down this recipe the day after Dinner Club, because I had bought far too much bacon and I wanted to use it while it was still thawed and fresh. 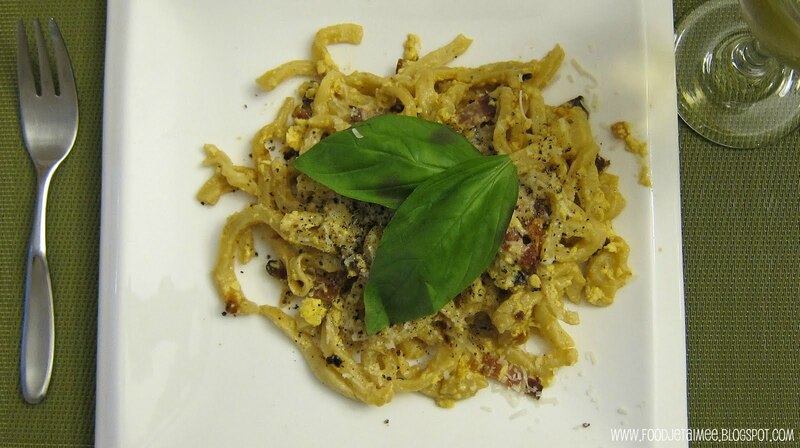 I hadn't made pasta since that day at the cooking class in 2010, so I really had to dig around in my memory for some instances where the recipe was a little unclear. 7. Mix very well and season with salt and pepper. A little vague in places, right? I measured out enough ingredients for 4 servings, which really only feeds 3 healthy appetites. I ended up adding about 2 tablespoons of olive oil to the dough to get what seemed to me like a good consistency. Once the dough is in a nice ball, refrigerate it for about 20 minutes. Then, once chilled, separate it into 4 chunks and roll them out one by one, as thin as you can. 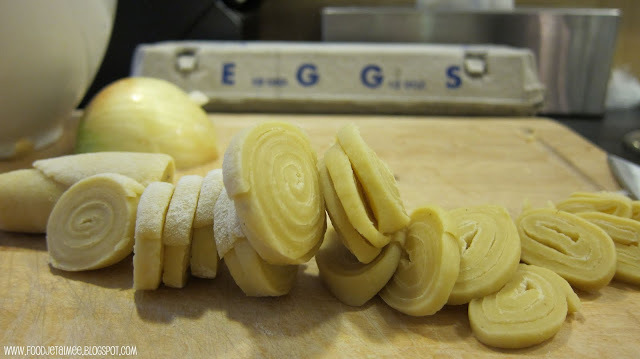 Roll each piece into a log by hand, and then thinly slice the log to get your noodles (see photo). 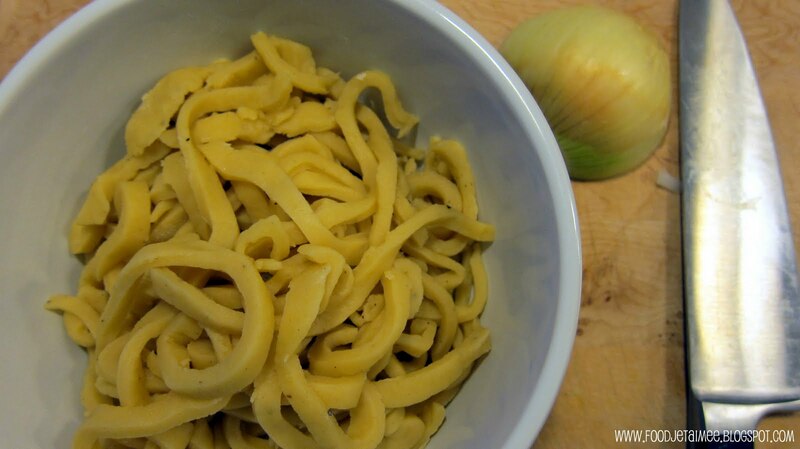 Unravel the noodles and boil them for 3-5 minutes, depending on how thick they are. The sauce is relatively straightforward, but make sure you stir like mad to incorporate the egg yolks. Don't let them rest in the hot pan for even a second or they'll turn chunky and much like scrambled eggs... as you'll see below. Can you spot the scrambled eggs? Quel désastre! Visually, a total flop, but delicious nonetheless. While the recipe and technique is very simple, in theory, I suppose I just don't have the knife skills (yet!) to make perfect, thin noodles. 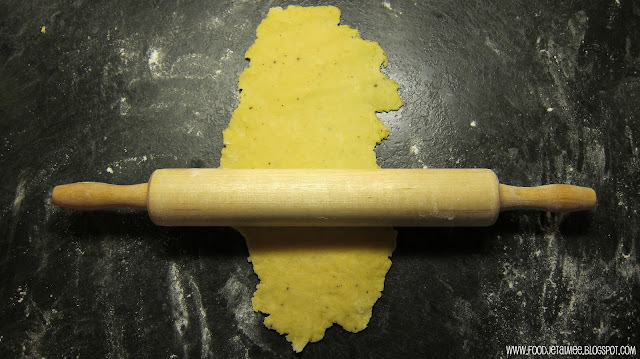 I also needed to roll my dough thinner; it was too thick to begin with. My second mistake was getting distracted by fishing my giant noodles out of the pot and not paying attention to what was happening in the pan next door. I completely forgot about never letting egg yolk hit a hot pan outside of breakfast. Stir, stir, stir! What resulted, on the plate, was something resembling misshapen, udon-style noodles, with bacon and scrambled eggs. Not exactly what I was going for. What I love about this recipe is that it's easy enough for any beginner to make, but yet complex enough that, each time you make it, there is always room to grow and perfect your method. I see the above photo as a rough starting point from which to improve upon and eventually perfect this dish. Care to share any tricks you've uncovered in homemade pasta-making? What's your favourite kind of pasta to make - or just eat? I, too, love that you posted this kitchen adventure... we all have them, don't we? I find that sometimes when trying something totally new, I need to make it once, even twice, so I can understand it. So I have a disaster once or twice but little by little I figure it out and am eventually on my way to perfecting it. I can make wonderful pasta but you should see my ravioli! I am hoping that 3 time's the charm! Oh, and I forgot to add - so funny about learning Korean cuisine - or not learning it - while living there. Just before we moved to Italy, husband bought me a pasta maker! Ha! Like bringing coals to Newcastle? Why make my own when I could buy fabulous homemade/handmade pasta at every market? I so get you! Too funny! What was he thinking with that pasta machine? I would almost feel disrespectful trying to make pasta in Italy! ;) So glad I'm not the only one. I tend to have beginner's luck with recipes, only to confidently go into round two and face a mess! Maybe third time's a charm for me, too. Thanks for the encouraging words and tips everyone! Will try and try and try again til I make this dish as beautiful to look at as it is to taste.